Bulk buying of oil can lead to good discounts. Thompson has an oil syndicate in place with Rix, but some residents have found this service not to be the cheapest and inflexible. If you are looking for oil, speak to your neighbours and try to get a bulk order of 2000L or more and then search for the cheapest deal. Check out www.fuelseeker.co.uk or www.boilerjuice.com for instant quotes and either order from there or use the quote to negotiate with your preferred local supplier. All it takes is a few minutes and the saving is worth it. Do you have a glut of Courgettes? Here's a quick and tasty recipe. Cut courgettes into medium quarters and fry them in a little olive oil. Add lots of freshly ground black pepper and salt. This takes about 4-5 minutes. When soft but not mushy, transfer them to a serving dish and grate lots of parmesan cheese over them. A nice extra would be black olives and capers added to the pan for the last couple of minutes cooking. If you have ever wondered how much electricity you use and how much money you could save, this is your chance to find out and have the opportunity to win a years worth of electric! Look out for this competition and entry form in the July/August edition of Breckland Council’s Voice magazine. Entry forms can also be collected from all Breckland Customer Contact Centres & online at www.breckland.gov.uk/energy_competition All entries must be submitted by 31 August 2009. For further details contact Breckland Council on 01362 656870. If you were affected by the power cut last Friday, 17 July then you can seek a compensation payment from your supplier. Within the village, power went out about 1.30pm on Friday and was not restored until after 7pm on Saturday. This is over 18 hours and under the Guaranteed Standards of Service, set by Regulator Ofgem, energy suppliers are obliged to make a payment in recognition of the disturbance - £50 for private households and £100 for commercial customers. To claim simply ring your electricity supplier. The telephone number for EDF Energy is 0800 028 4587. If you have any problems claiming this, contact us for assistance. New Mobile Phone Directory. Early next week all UK mobiles will be on a directory which will mean that anyone will be able to access the numbers. It is easy to unsubscribe but it must be done before the beginning of next week to make sure that you are ex-directory. You may want to suggest it to all your friends and family who have UK mobiles or they could be swamped by unsolicited messages and calls. Removal is recommended by the BBC - see link below. 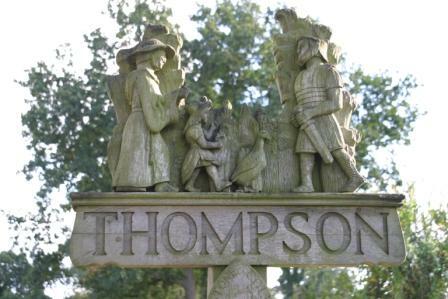 Join the Thompson Women's Institute. The WI has long had a reputation as a jam-making, Jerusalem singing organisation, but that simply isn't true. There is no denying the culinary skills of many of our long-standing members, but the look and feel of your local WI is shaped by its members. We at Thompson WI have a very social outlook and a great mix of women. Another great benefit of WI membership is access to Denman College, where there is a vast selection of courses on everything from Antiques to Yoga. Have a look at our page on this website for more info - go on, give it a go! Bindweed & Ground Elder are a gardner's nightmare, but you can put them to good use. Fill a large container with these and other perennial weeds and cover them with water. Cover with black polythene (use an old compost bag) to cut out the light. This will create a slimy soup and when it smessl, the liquid can be watered into plants as a weak fertiliser and the weed residue can go straight onto the compost. The underwater treatment will successfully kill off roots which would not be destroyed by standard composting. It's great to know that the weeds can do some good after all. Did you know that there is a Thompson Oil Syndicate set up, thanks to Terry Gilmour. Over 20 local residents have signed up to this syndicate and they receive oil at a very competitive price from Rix, a local oil distributor. If you are interested in joining, simply contact Rix on 0800 5424924 for full details. Did you know that there is a bottle bank located in the car park of The Chequers for use by villagers? Even better, the money which comes from this recycling comes back to the village as income to the Parish Council. So there's no need to lug your empties all the way to Tesco, Watton - just bring them to the pub! CAB have put together a guide to help on surviving in these tough economic times. It has useful local telephone and other contact numbers for organisations which may help at this time. Click here for this CAB Guide to surviving the Recession, which can be downloaded and printed. Now that electricity prices are coming down, it is a good time to check your meter reading against what your supplier is billing you. One resident recently checked their supplier's estimated reading against the actual and was able to reduce their bill by £143 - what a saving. When prices are going up, suppliers seem to underestimate the readings and when prices are falling, they seem to overestimate. Martin Lewis, the money saving guru, has a great website which is worth bookmarking - www.moneysavingexpert.com Be sure to look at it regularly.